A few weeks ago, my expecting wife told me that she had been trying to listen to more Springsteen lately now that the baby’s hearing is developing. It’s one of the nicest things anyone has ever done for me. 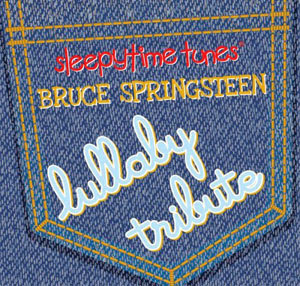 Similarly, I was overjoyed when my wife gave me an amazing surprise present for Christmas… Sleepytime Tunes: Bruce Springsteen Lullaby Tribute. Contained on the CD are ten tracks of melodic Springsteen covers that will have you quietly rocking out while your baby (hopefully) drifts off to sleep. I'm impressed with the variety of Springsteen’s catalogue that is represented on the album. I commend The Lullaby Players for choosing recent tracks off Magic and Working on a Dream, rather than just leaning on established classics. Each track sounds like it could be in the trailer for the latest animated feature from Nickelodeon. In that regard, my favorite is “Radio Nowhere”, which sounds like the theme song to a really awesome adventure across time and space. Another highlight is “Secret Garden”, whose melody lends itself naturally to a lullaby (but let’s hope the baby doesn't accidentally learn the lyrics). To me, the most puzzling entry is “Pink Cadillac”. I’m not sure how it was chosen, as I imagine it’s less recognizable to most, but I guess it does have a distinct melody. Either way, it’s another track where I hope the baby doesn't learn the lyrics (depending on your analysis of its double entendre). All in all, this CD is a must have for any Springsteen fans who are expecting. Stay tuned to find out if the baby enjoys it as much as the parent.